Acting (Re)Considered is an exceptionally wide-ranging collection of theories on acting, ideas about body and training, and statements about the actor in performance. This second edition includes five new essays and has been fully revised and updated, with discussions by or about major figures who have shaped theories and practices of acting and performance from the late nineteenth century to the present. The essays - by directors, historians, actor trainers and actors - bridge the gap between theories and practices of acting, and between East and West. No other book provides such a wealth of primary and secondary sources, bibliographic material, and diversity of approaches. It includes discussions of such key topics as:* how we think and talk about acting* acting and emotion* the actor's psychophysical process* the body and training* the actor in performance* non-Western and cross-cultural paradigms of the body, training and acting. 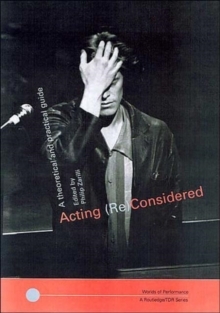 Acting (Re)Considered is vital reading for all those interested in performance.